During my thirty-five-year nursing career, I have been privileged to sit with patients and families of patients awaiting imminent death. I have had the honor of helping families cope with difficult medical decisions. I have been present to many people in their suffering. But not one of those many encounters over the years prepared me for this horrific night, when the patient was my precious daughter and she lay before me, wishing to die. This crisis followed a long and difficult pregnancy and weeks of incapacity from a stent placed into her left kidney to help pass several large kidney stones. She had gone into the hospital to have it removed so that she could once again enjoy limited mobility and some respite from the pain. She returned to her room following kidney surgery in nearly unbearable agony. Rather than remove the stent, the surgeon also had to place one in the other kidney to help pass a total of five stones that no Western medical treatment or device could dissolve, and the resulting pain was beyond all pharmaceutical relief. Her breath was short and gasping, her hands clutched the sheets, and her ashen face was drenched with perspiration. It was more than I could bear to witness – and there was absolutely nothing I could do for her. If ever I had wished for the power of the Gods to perform a miracle – this was the moment. Since that was not possible, my sense of inadequacy, frustration, fatigue from eight months as caregiver, anger, sorrow, and fear raged through my being with a force that transcended every emotion I had ever known. I was shattered and yet captive of the moment. I had to stay connected. It was like standing with my finger in a live socket taking the volts of electricity and not being able to let go. Together, my daughter and I barely endured another endless night. The next morning the phone rang. I picked it up expecting it to be my husband. Each day that he was unable to come to Sioux Falls he would call for an update on the status of his beloved daughter. The voice on the other end wasn’t his, but rather that of Wanigi Waci. “If you like, I can bring medicine to her, Jo,” he offered. Little did I know that this offer would take me into another dimension of health and healing, to a place I had never been before, a place that would explain the appearance of the five stones and the meaning they held for the women in my ancestry. Description: JoEllen Koerner was raised in a small Mennonite community in South Dakota, became a Civil Rights activist in the South, and rose to prominence as a nurse executive of international repute. None of these life experiences, or her honed skills as a Western medical practitioner, prepared her for the moment every parent hopes never happen: Her daughter, Kristi, her body wracked with pain, asks permission to die. Into the depths of this dreaded moment enters Wanigi Waci (Spirit Dancer), a dear friend and keeper of the Lakota Sioux healing traditions. He invites Kristi and JoEllen into his People's time-honored healing ways and giving community, using Native American alternative medicine with ramifications whose importance ultimately surpasses the restoration of Kristi's health. Mother, Heal My Self, a work of surpassing beauty and power, invites the reader to explore the deeper powers of spiritual healing and the necessity for increased intergenerational awareness. 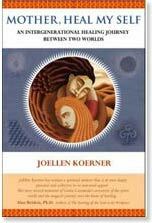 The book's raw honesty makes JoEllen Koerner's quest everyone's quest for meaning. About the Author: JoEllen Koerner, Ph.D., RN, FAAN, is past president of the American Organization of Nurse Executives and an originating member of the Center for Nursing Leadership. She is co-founder of the Healing Web, a collaborative education-service model that facilitates service learning in the community. We inhale, we exhale, this we know. Our breath is the most important healing gift we have. Breath feeds flesh and bones so one may ACTUALIZE ONE’S POTENTIAL. Movement is initiated by the breath. Breath is Life. It is a natural reality that is present in us all. When we consciously work with our breath the mind becomes focused and our breath carries thought around the world. Motherearth inhales and exhales, just as we do. Sacred life energy moves within her body as it does in ours. Simply in the way we begin our day we experience the power of breath and movement to bring harmony and to clarify the mind. Our physical existence depends upon our breath. Breath is paramount in all we do and crucial in all physiological functions of our body. Breathing is not only a physical process it is the vital source connected to the functioning of mind and emotions. When we are in touch with our breathing our state of mind and emotions are affected. Feelings, thoughts and emotions may be released, our thoughts and emotions stabilize, giving way to relaxation and ease, bringing clarity and focus to our being. During the Seven Directions Movement Meditation we learn to synchronize the movements of the body with the flow of the breath. Basically, the breathing in of the vital force is done with the movements of receiving, gathering in. Sending out, the give away movements are performed with full exhalation. As the breath and movement become in harmony so the dance flows with ease and grace. When the mind and movement are in harmony the mind remains focused. 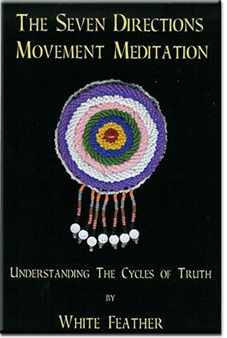 Collect all three of White Feather's Seven Directions Movement Meditation; includes booklet, CD, and video. With this complete set you will be practicing this dance with ease and grace : )) The perfect gift for someone who has everything! "White Feather has provided us with a phenomenal expression of human movement that is connected with earth energy. She has shared this with countless people to help them feel their wholeness as an expression of inner truth." Grandmother Twylah Nitsch, Elder of the Seneca Wolf Clan. Lesson 4. The Dedication. We will discuss the dedication, its importance , what it means and how it effects us in our daily life and future Course Goals: Learn the Cycles of Truth wisdom. Offer your love and thoughts of peace to Mother Earth, our first Mother and to all of our relations. Maintain an attitude of gratitude in all we do. Balance and restore your energies. Create Harmony and centeredness in life.